The Cost of Dental Veneers - Why Do Prices Vary So Much? The cost of dental veneers can come as a shock. In private practice (without any insurance cover), you won't find much under $500 per tooth. And dental veneer prices can go all the way to over $4000 per tooth in extreme up-market locations like Beverley Hills, New York or London. You can get high-quality veneers in most places in the USA, Canada, Europe and Australia for between $500 to $1,000 per tooth. Dental veneers (or "dental laminates", or sometimes "porcelain laminates") are generally more expensive than most people expect. After all, what's the big deal? They are only little bits of porcelain that you get stuck on your teeth! Actually, they are quite complicated for both the dentist AND for the dental technician. They require extremely precise and accurate work! The cost of dental veneers is mainly a result of the incredible skill required in the dental laboratory, to produce the "thin as a contact lens" layer of porcelain that gives the life-like appearance we all want. What material the veneers are made of, for example the type of ceramic. How and where the veneers are manufactured; laboratory-made or Cerec veneers. How much your dentist charges for his time and where he is located. First up, dental veneer prices depend on how many veneers you need. The more veneers you get, the more it's going to cost. Maybe it's just the 2 front teeth. That's not so bad! Interestingly, getting just one single solitary veneer on its own can be a mistake, from a cosmetic point of view. It is exceedingly hard for a dental laboratory to get a perfect match with neighboring natural teeth. Not impossible, but very difficult. Be prepared for 2 or 3 attempts before it looks good! Usually, people getting veneers are interested in improving the appearance of several teeth. But you need to look at ALL the visible teeth when you smile. If you just get the upper front 6 teeth veneered, the side teeth can end up looking a bit odd. A general rule of thumb is that the best numbers of veneers (from a cosmetic point of view) are either the 2 upper front teeth, the 4 upper front teeth, or 8 to 10 upper teeth. 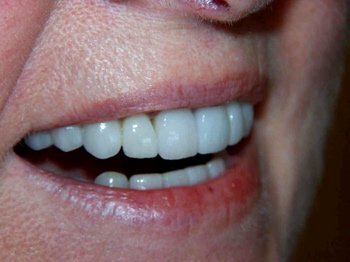 It is possible to do the upper front 6 teeth, but as I've already said, sometimes the side teeth end up looking a little "different". This is where a wax mock-up of the 2 treatment possibilities is very helpful. You get to see what the 2 options might look like, with either 6 veneers or 10 veneers, before you make any decisions. You can read more about this at Cosmetic Dentist Veneers. 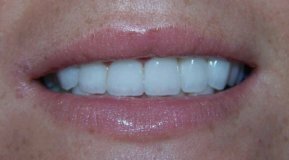 Here are 10 veneers that I did a few years ago. All the visible upper teeth are veneers. Second, the material for the veneers also plays a role here. Most veneers are made by hand with dental porcelain. The higher the quality of the porcelain, the higher its price. This hand-made method is probably best if you're getting 2 or 4 veneers. It is also possible to get veneers made in a material which is technically a glass. Instead of being built up layer by layer, it is cast in one piece. This is more high-tech, and claimed to be stronger. The market leader is a material called IPS e.Max. One possible drawback is that these veneers can look a little artificial. But this depends on the artistic skill of the laboratory technician. They are probably best suited to people getting 8 or 10 veneers. Another possibility is a veneer that is machined out of a solid block of ceramic material, using CAD/CAM technology. The most widely used system is probably the Cerec machine. You can read about this at Cerec veneers. The cost of dental veneers made by the Cerec method will tend to be lower than the hand-made ones. The CEREC technique is REALLY high tech, and fascinating if the dentist lets you watch the milling machine in action - you see your own veneers being milled out of ceramic in real time! BUT this technique is extremely demanding on the dentist - he has to do ALL the work. Third factor affecting the cost of dental veneers is where the veneer is made. By this, I don't mean "where in the country", I mean which dental laboratory. There are huge differences between labs in terms of the product they offer, price and quality. Think of it as being like the automobile industry. Some labs are like Volkswagen or Ford, producing good quality veneers in large numbers, at reasonable prices. At the other extreme there are the small specialist laboratories, producing a very small number of extremely high-quality veneers. Like Porsche cars. If you want the most natural-looking and strongest veneers, it'll cost more. This is a reflection of the technician's time and skills. Fourth, what your dentist charges for his own time. This is usually linked to where his office is located. A dentist in Manhattan will have higher expenses for his office than one an hour out of town in New Jersey. So his overall charges will be higher. This reflects higher property prices, and higher employment costs. The effects of these factors is often multiplied. You tend to get all the factors coming together at one extreme or the other! For example, a dentist in Manhattan is much more likely to have patients asking for cosmetic veneers than a dentist in Smalltown in the mid-west. Because there is much more competition between dentists in Manhattan, he has to make sure that any treatment he does will be good for his reputation. He can't afford to have an unhappy patient! So he tends to go to extremes in all his recommendations. He will recommend 10 veneers instead of 6. He will send the work to a top dental laboratory where they have Top-Gun technicians. He will use the most expensive materials. See how the costs snowball? His dental veneer prices will end up being relatively high. On the other hand, our dentist in Smalltown has to be careful for his reputation, too. But the problem here is to avoid getting a reputation for "being expensive". recommend 4 veneers rather than 8 or 10. After all, you can always do the extra ones later, if it turns out to be necessary. When it comes to laboratory, he is unlikely to have a top-flight lab in his town. So he will send the job to the nearest lab that he has had good results with. The technician's time will cost less. The materials are likely to be not the most expensive. So we have a number of factors coming together to bring the cost of dental veneers down. My recommendation? Like most things in life, you tend to get what you pay for. BUT there ARE some things you can do to keep the cost of dental veneers reasonable. I recommend looking for a dentist who is a Fellow of the American Academy of Cosmetic Dentistry. There are several levels of membership, and the "top" one is Fellow of the AACD. This is higher level than someone who is a "member" or "associate". These guys will have had to pass very difficult examinations to get this qualification, and they will do a great job for you. Find one outside a city centre location, and the cost of dental veneers at his office may well be reasonable. After all, if you want your veneers to look great for at least 15 years, you can't afford to get cheap ones! Here is a link to the American Academy of Cosmetic Dentistry, to help you find a cosmetic dentist in your area.